Bangkok Airways is an oddity – a successful independent full-service short-haul carrier that has been able to grow despite competing in a market dominated by LCCs and large aligned flag carriers. Bangkok Airways now seeks another oddity – an initial public offering in a market that in recent years has only seen LCCs and occasional flag carriers go public. The remainder of 2013 will see four Southeast Asian carriers attempt IPOs: three LCCs in AirAsia X, Indonesia AirAsia and Nok Air; and low-profile Bangkok Airways. If successful with its upcoming listing on the Stock Exchange of Thailand, Bangkok Airways will have the cash to accelerate network and fleet expansion. The carrier, which currently operates 23 aircraft, is well positioned to expand despite facing intensifying competition in most of its markets. Bangkok Airways’ biggest strength is a wide and growing portfolio of partnerships, which gives it access to high-yield passengers. Several of its partners are growing rapidly at the carrier’s main hub, Bangkok Suvarnabhumi, and need more regional feed. Bangkok Airways also has an unrivalled network in a strong growth region. Its partners need this network, and in many cases can only access growing Southeast Asian tourist destinations via Bangkok Airways. As a result Bangkok Airways should have sufficient demand to continue to add capacity in its existing markets while launching new niche destinations and sticking to its rare but successful full-service boutique model. Bangkok Airways has filed with the Stock Exchange of Thailand to sell 730 million shares, including 520 million new shares and 210 million existing shares. Bangkok Airways has not yet set a date for its IPO or a share price. President Puttipong Prasarttong-Osoth told CAPA on the sidelines of the 4-Jun-2013 IATA annual general meeting in Cape Town that the carrier aims to list at the end of Jun-2013, “but it may slip to July”. Capt Puttipong’s family currently owns nearly 100% of the company, which includes airport, ground handling and catering subsidiaries. He says he seeks to sell at least a 25% stake. Bangkok Airways is poised to follow by only a couple of weeks its competitor Nok Air, which is holding an IPO from 12-Jun-2013 to 14-Jun-2013 and aims to debut its listing on the Stock Exchange of Thailand on 20-Jun-2013. Nok is selling 187.5 million shares, including 125 new shares and 62.5 million existing shares. It has set an IPO price of THB26 (USD 0.84), which should raise about USD157 million. The IPO at Nok will result in a divesture of about 30%. Another LCC, Thai AirAsia, completed its IPO on the Stock Exchange of Thailand in May-2012, raising USD143 million. Thai Airways, which currently owns 49% of Nok Air, is also publicly traded. Capt Puttipong does not believe being the third Thai airline to seek a public listing within a short period will be a disadvantage as Bangkok Airways has a completely different business model and product proposition than its LCC competitors. Investors in recent years have gravitated more to LCC IPOs. But the LCC sector in Southeast Asia has become intensely competitive and over-crowded. Bangkok Airways offers an intriguing alternative. Bangkok Airways expects its IPO could raise about USD320 million, more than double the amount raised by Nok and Thai AirAsia. What Bangkok Airways has in common with Thailand’s two LCCs is an ambition to expand using the proceeds of the IPO. Nok currently operates 17 aircraft and plans to use the cash generated from the IPO to grow its fleet to 30 aircraft by the end of 2015. Bangkok Airways aims to grow its fleet from 23 to 33 aircraft within five years while Thai AirAsia has already accelerated expansion and is in the process of adding seven A320s in 2013 for a fleet of 34 aircraft. 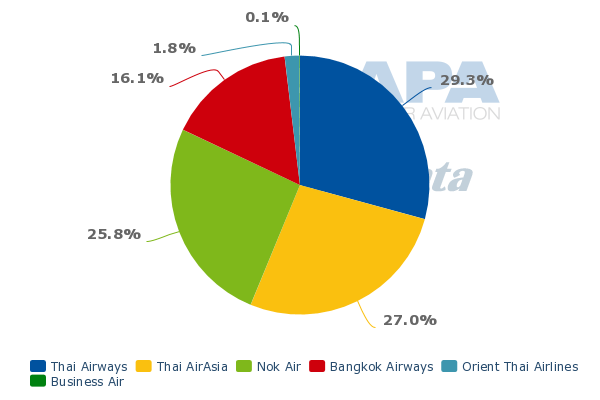 Bangkok Airways currently accounts for about 7% of total capacity in Thailand, including a 16% share of the domestic market and a 3% share of the international market (see background information). Domestically it is not much more than half the size of Thai AirAsia, Nok or Thai Airways. It will never be as big as its three main competitors but the market is large enough to support a second modestly sized full-service carrier, particularly when taking into account Bangkok Airways’ portfolio of partners and its strong position in certain highly profitable markets. Bangkok Airways is unique in that it owns three regional airports in Thailand – Koh Samui, Sukhothai and Trat. The Koh Samui airport is particularly a valuable asset as it gives Bangkok Airways exclusive access to one of Thailand’s premier island destinations. Samui, which is Thailand’s sixth largest airport based on current seat capacity, is not served by any LCC. Bangkok Airways accounts for almost 90% of capacity at Samui. Thai Airways, Singapore Airlines regional subsidiary SilkAir and Malaysia Airlines regional subsidiary Firefly are the only other carriers serving Samui and have to pay Bangkok Airways to access the airport. SilkAir and Firefly/MAS are partnered with Bangkok Airways in the Samui to Singapore and Kuala Lumpur markets. Samui is Bangkok Airways’ second largest base after Bangkok Suvarnabhumi. Sukhothai and Trat are also appealing tourist destinations but are tiny markets, served with only two and three daily flights, respectively. Therefore they are not featured among the carrier’s 10 largest destinations. Samui-Bangkok is Bangkok Airways’ largest route by a wide margin, with over 17 daily return flights and over 30,000 weekly return seats. The route accounts for 40% of Bangkok Airways’ total domestic capacity. Overall Samui accounts for 49% of the carrier’s domestic capacity. Bangkok Airways also operates four daily flights from Samui to Phuket, its third largest base, and has one daily flight from Samui to Chiang Mai, Krabi and U-Tapao/Pattaya. Most of its other domestic capacity is allocated to major trunk routes, particularly Bangkok to Chiang Mai and Phuket – which are the largest domestic markets in Thailand with intense competition from LCCs. Otherwise Bangkok Airways has traditionally focused on niche domestic routes where there are no competitors, such as Bangkok to Sukhothai, Trat and Lampang and Phuket to U-Tapao. But Bangkok Airways is gradually starting to compete on more trunk routes. It resumed service in Apr-2013 on Bangkok-Krabi and aims to launch service by the end of 2013 on another popular LCC route, Bangkok-Udon Thani. The addition of Udon Thani and Krabi gives Bangkok Airways service to seven of Thailand’s top 10 airports. It still does not serve Chiang Rai, Hat Yai and Surat Thani. Of Thailand's 38 airports, Bangkok Airways currently serves just nine. Nok serves more than 20 and Thai AirAsia 13, according to Innovata data. Bangkok Airways also operates three international routes from Samui, including a double daily service to Hong Kong and daily services to Singapore and Kuala Lumpur. But about 80% of its international capacity is allocated to Bangkok, where it serves nine international destinations with a 10th, Mandalay in Myanmar, to be added in Sep-2013. 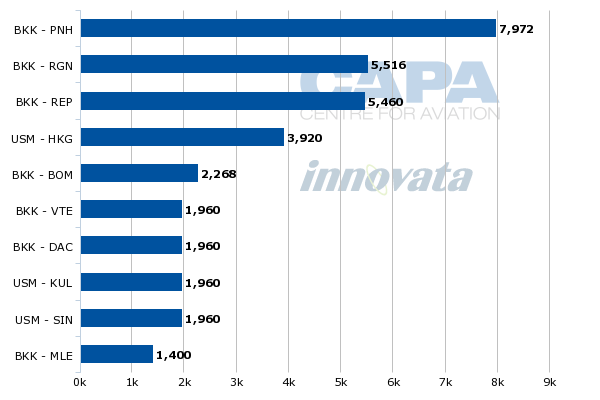 About 31% of the carrier’s seats and 48% of its ASKs are now allocated to the international market, according to CAPA and Innovata data. Most of its international routes are to niche markets with limited competition. Bangkok Airways only serves major international hubs from Samui. Hong Kong, Kuala Lumpur and Singapore are only served from Samui as these markets from Bangkok are intensely competitive. Bangkok Airways has particularly built up a strong presence in Cambodia, Myanmar and Laos. 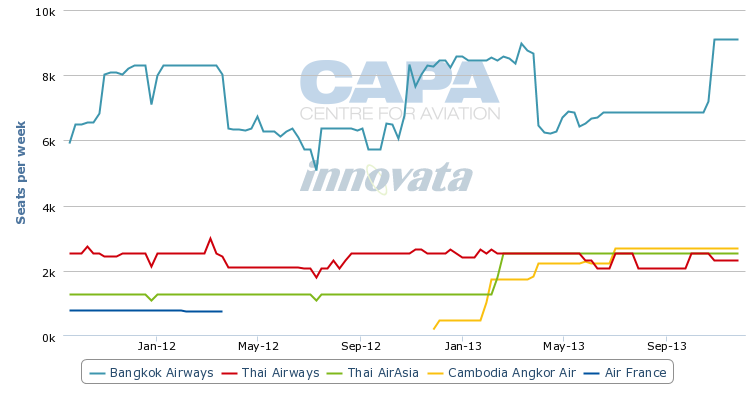 Bangkok Airways currently has a leading 50% share of seat capacity in the Thailand-Cambodia market. 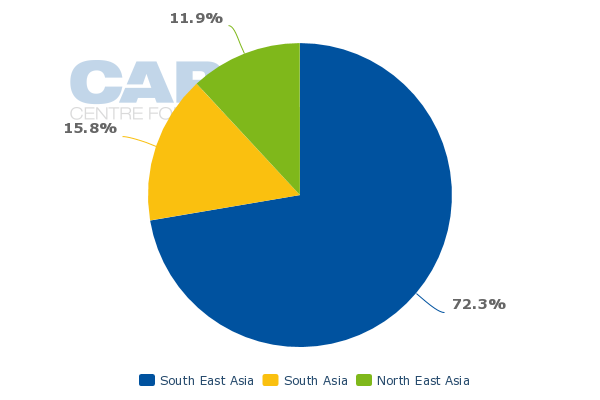 It has an 18% share of seat capacity in the Thailand-Laos market and a 16% share of seat capacity in the Thailand-Myanmar market, according to CAPA and Innovata data. Bangkok-Siem Reap and Bangkok-Phnom Penh are the carrier’s two largest international routes, with five and four daily frequencies respectively. On a capacity basis Phnom Penh is bigger as it is served with A319s/A320s while Siem Reap is served mostly with ATR 72 turboprops. 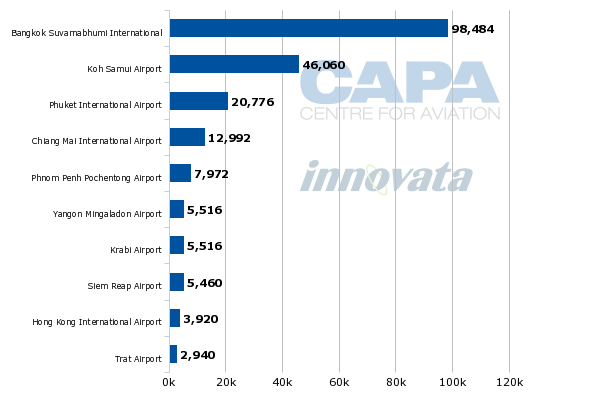 Bangkok Airways currently accounts for over 10% of international capacity in Cambodia, giving it the biggest share after Cambodia Angkor Air and its part-owner Vietnam Airlines. Bangkok Airways previously had a subsidiary in Cambodia but had to shut it down in late 2008 due to government resistance. The Cambodian government subsequently established Cambodia Angkor Air with Vietnam Airlines. Bangkok-Siem Reap was a monopoly market for Bangkok Airways until late 2012, when Cambodia Angkor Air launched service. Siem Reap has traditionally been one of Bangkok Airways’ most lucrative markets given the lack of LCC competition and the fact that Siem Reap is a fast-growing tourist town that is popular with European tourists but is not served directly by any long-haul carrier. Bangkok-Phnom Penh is a more competitive market with a more even mix of business and leisure passengers. Bangkok Airways currently competes on the Bangkok-Phnom Penh route against Thai Airways, Thai AirAsia and Cambodia Angkor Air. Bangkok Airways currently has three daily flights between Bangkok and Yangon, its third largest route based on frequencies and its second largest route based on seat capacity. Capt Puttipong tells CAPA that the carrier plans to add a fourth daily flight to Yangon by the end of 2013. Daily service from Bangkok to Mandalay, the second largest city in Myanmar, will be launched in Sep-2013. Demand in the Thailand-Myanmar market has increased significantly over the last year, leading to capacity increases from all of the established players in the market – Bangkok Airways, Thai AirAsia, Thai Airways and Myanmar Airways International. The Bangkok-Yangon market has become even more competitive with the recent launch of services from Golden Myanmar Airlines and the upcoming launch from Nok Air. Like Siem Reap, Luang Prabang in Laos has been a unique and profitable destination that has helped cement Bangkok Airways' position as a boutique carrier with unmatched access to UNESCO heritage sites. Bangkok Airways currently operates one daily flight on the Bangkok-Luang Prabang route with a second frequency in the northern hemisphere winter season. Codeshare partner Lao Airlines is the only other carrier on the route. The Lao government has repeatedly denied Thai AirAsia access to Luang Prabang, which has benefitted Bangkok Airways and Lao Airlines. Thai Smile is also now seeking to enter the Bangkok-Luang Prabang route. Thai Smile has a better chance than Thai AirAsia but the Lao government still appears to be reluctant to allow a significant increase in capacity at the town’s small airport despite the recent completion of a new terminal. Bangkok Airways launched service from Bangkok to the Lao capital Vientiane in 2012 after securing traffic rights for the route ahead of a frustrated Thai AirAsia. Thai Airways and Lao Airlines already operated the route and the entrance of a second Lao carrier, Lao Central, provided an opening for a second Thai carrier. But the opening also has resulted in over-capacity, making the new route challenging for Bangkok Airways even without any LCC competition. Bangkok Airways also has built up a network in South Asia and China, again focusing primarily on niche destinations with limited competition. All of Thailand’s carriers including Bangkok Airways are preparing to significantly expand their Chinese networks over the next several years in response to rapid growth in the Thailand-China market. China has emerged as the largest and fastest-growing source of tourists in Thailand. Capt Puttipong says Bangkok Airways is looking at several potential routes to mainland China from Samui. This would be in line with Bangkok Airways’ strategy to differentiate itself from competitors by focusing on different markets. For now Chinese tourists generally take their holiday in Bangkok and/or Phuket. But Samui is starting to increase in popularity among the Chinese. Capt Puttipong believes as Chinese tourists return to Thailand for their second visit, Samui is a popular option while Bangkok and/or Phuket are the typical itinerary for first time visitors. While there is growing demand for Bangkok-China and Phuket-China routes, this is a market being aggressively targeted by Chinese carriers, Thai AirAsia and the Thai Airways Group, using the Thai Airways, Thai Smile and Nok brands. Thailand-based leisure carriers such as Orient Thai and Business Air are also pursuing expansion in the Bangkok-China and Phuket-China markets. Bangkok Airways previously operated scheduled flights from Bangkok to a handful of cities in mainland China. But these routes were cut back in 2008 and 2009 along with service to Fukuoka in Japan. Capt Puttipong says Bangkok Airways currently only operates charter flights between Bangkok and China. In South Asia, Bangkok Airways currently serves Dhaka in Bangladesh, Male in the Maldives and Mumbai in India. Service to Bangalore was dropped in 2012. Bangkok-Male is a niche upmarket leisure route not served by any other carrier. Dhaka is not a typical Bangkok Airways market as it consists mainly of migrant workers. But Capt Puttipong says the Bangkok-Dhaka route has been successful despite being a competitive and generally low yielding market. He says load factors are high, a large amount of high yielding cargo is carried and the flight operates during overnight hours, helping improve aircraft utilisation. The Mumbai route, launched in 2011, is also a competitive market but Bangkok Airways saw an opportunity given the growth in Indian tourist traffic to Thailand. Capt Puttipong says traffic on its Bangkok-Mumbai service is improving and the carrier may look at additional destinations in India in response to the rapid rise in tourist arrivals from India. But overall Southeast Asia remains Bangkok Airways’ core market, accounting for about 72% of its international capacity compared to 16% for South Asia and 12% for North Asia. This is unlikely to change significantly as Bangkok Airways remains primarily focused on its core market, Southeast Asia. Vietnam remains a white spot in Bangkok Airways’ network which will likely be addressed as the carrier looks to build on its strong position in ASEAN. “In the end we’ll have to go to Vietnam to complete our network,” Capt Puttipong acknowledges. Ho Chi Minh, Danang and Hanoi are all under consideration. Vietnam, Brunei and the Philippines are the only ASEAN countries currently not served by Bangkok Airways. While Bangkok Airways plans to continue to grow its network in Southeast Asia, South Asia and China, the main focus will be adding capacity in existing markets. “The plan is to cover the region and strengthen the network by adding frequency,” Capt Puttipong says. The carrier already serves most of the popular tourist destinations in Southeast Asia. As tourist figures grow at these destinations, Bangkok Airways will grow as it tries to maintain its market share. While LCC capacity within Southeast Asia continues to increase rapidly, Bangkok Airways is well positioned to compete as it caters mainly to passengers coming off long-haul flights and seeking to travel around the region. Bangkok is by far the largest hub in Southeast Asia for European, Middle Eastern and African carriers. Star Alliance members typically work with Thai Airways, leaving other carriers that serve Bangkok to seek relationships with Bangkok Airways. Bangkok Airways currently partners with a wide mix of oneworld, SkyTeam and unaligned carriers. Bangkok Airways currently has 11 codeshare partnerships – Air France (SkyTeam), airberlin (oneworld), British Airways (oneworld), Etihad Airways (unaligned), EVA Air (about to enter Star), Finnair (oneworld), Japan Airlines (oneworld), KLM (SkyTeam), Malaysia Airlines (oneworld), Qatar Airways (about to enter oneworld) and SilkAir (unaligned). 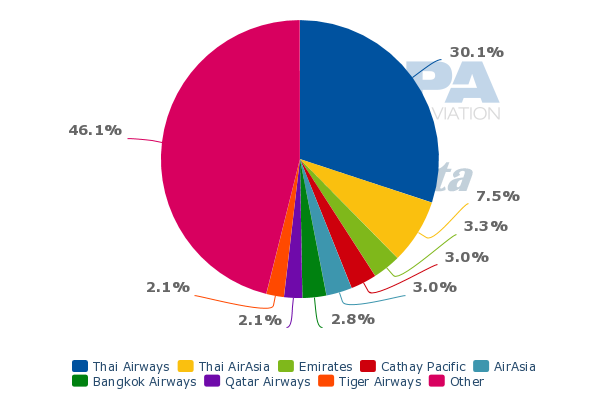 BA and Qatar have been added in recent weeks and Bangkok Airways expects to add a few more codeshare partners by the end of 2013. The JAL codeshare was added in late 2012 and represented a big breakthrough for Bangkok Airways as the carrier has been trying to partner with a Japanese carrier for some time. Japan is one of Thailand’s largest sources of tourists but JAL currently only serves one destination in Thailand, Bangkok. Capt Puttipong says that Bangkok Airways is currently discussing a partnership with another oneworld carrier, Qantas. The Australian carrier is keen to add partners in Southeast Asia as part of its increased focus on the Australia-Southeast Asia market and recently approached Bangkok Airways about a potential codeshare. Qantas is expected to codeshare with Bangkok Airways in Singapore, where Bangkok Airways serves Samui, as well as Bangkok. Bangkok Airways could potentially give Qantas access to several destinations throughout Southeast Asia that are already part of the virtual network of rival Virgin Australia, which has an extensive codeshare with Singapore Airlines and SilkAir. Qantas needs more regional feed in Singapore and Bangkok as it no longer routes any of its London flights via these cities. While codeshares are important, interlines are an even bigger revenue generator as they cover a wider mix of carriers. Codeshares account for 5% to 10% of Bangkok Airways’ revenues while interlines account for about 50%. Bangkok Suvaranabhumi is currently served by over 80 foreign carriers. 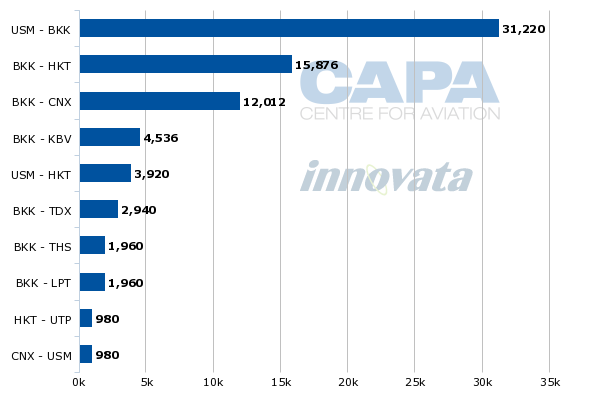 Nearly all of these carriers have interlines with Bangkok Airways. Most of the medium and long-haul foreign carriers serving Bangkok have a limited number of gateways in Southeast Asia, which plays into Bangkok Airways’ strength. Bangkok Airways also interlines with Thai Airways. The two carriers have previously talked about a codeshare – which would make sense as their networks do not completely overlap. Capt Puttipong says Bangkok Airways would like to partner with Thai Airways, saying: "You don’t have to compete all the time." The rapid expansion by the Gulf carriers in Bangkok has particularly benefitted Bangkok Airways. Emirates, Etihad and Qatar currently offer nearly 80,000 weekly seats to and from Bangkok. To put this into perspective this is more than double the total international capacity of Bangkok Airways. Etihad is currently Bangkok Airways’ largest codeshare partner while Emirates has been one of the carrier’s largest interline partners in recent years. As the Gulf carriers continue to pour capacity into Bangkok, the amount of feed required from regional destinations will continue to increase. Bangkok Airways provides feed from several domestic and international destinations that are too small to be served directly from the Middle East. Given the requirements of its partners, Bangkok Airways is confident significant increases in capacity across its existing route network can be supported over the medium to long term. The capacity increases will be pursued through a mix of additional frequencies and up-gauging flights from the ATR 72 to A319/A320 and from the A319 to the A320. For Samui, up-gauging is particularly important as the airport is currently capped at 36 daily movements for environmental reasons. Capt Puttipong is confident the cap will eventually be increased but for now the carrier is adding capacity at Samui by deploying more jets. Over the medium to long term Bangkok Airways needs the cap to increase and to retain control of Koh Samui Airport, which has been politically controversial. Otherwise it may be forced to direct additional capacity to less profitable markets. Capt Puttipong says the carrier plans to use the proceeds of the IPO to support expansion of its fleet from 23 to 33 aircraft over the next five years. Bangkok Airways will initially focus on increasing the size of its A320 family fleet by 10 aircraft as it does not see a need to increase its turboprop fleet. It currently operates 15 A319/A320s and eight ATR 72-500s. In addition to narrowbody growth, proceeds will be used to renew the existing fleet. Capt Puttipong says a new-generation turboprop will likely be selected by the end of 2013. The carrier is currently evaluating the ATR 72-600 and Bombardier Dash 8Q400. Bangkok Airways is also starting to look at new-generation narrowbody aircraft but a decision is not as imminent. Capt Puttipong expects Bangkok Airways will begin the transition to the A320neo or 737MAX in the 2018/2019 timeframe. Fleet renewal will also give Bangkok Airways the opportunity to offer a more standard premium product across its network. The carrier currently has a mixed A320 fleet with some aircraft in all-economy configuration, some with a convertible business class section and some with a fixed business class cabin. This has made it challenging to sell a premium product. Bangkok Airways has looked at retrofitting its existing fleet to provide a standard premium product but Capt Puttipong says that the carrier has decided at least for now to retain a mixed fleet, explaining demand for business class is much stronger in some markets compared to others. Bangkok Airways previously looked at expanding into the long-haul market, placing an ill-advised order for A350 widebodies at the end of 2005. But two years ago Bangkok Airways cancelled its A350 order and is now focused entirely on the regional market – a smart strategy as it will make it easier to cement its relationships with long-haul operators if it does not compete with its partners. The company also has previously studied expanding into the budget end of the market with an LCC subsidiary. But Bangkok Airways has decided against a multi-brand strategy – which is also a smart move given the intense competition among LCCs in Southeast Asia. The outlook for Bangkok Airways is bright as long as it does not get too ambitious and is not distracted from its core boutique carrier strategy. The carrier should be able to grow and be profitable while staying independent and sticking to its regional focus. Investors may be wary as Bangkok Airways has a very low profile and is focused on the top end of the market in a region where almost all the growth is at the lower end. But there is still demand for a full-service product within Asia, particularly for carriers such as Bangkok Airways that are able to rely heavily on passengers coming off long-haul flights. Bangkok Airways will continue to be an oddity – and a successful one.